Seed Journey is a seafaring voyage connected to a public art project in the former port of Bjørvika in Oslo, Norway. Seed Journey moves people, ideas and seeds through time and space. This voyage—its crew and cargo—are agents that link the commons as they relate to local networks and a more global complex of seed savers and stewards of the land, air and water. A rotating crew of artists, anthropologists, biologists, bakers, activists, sailors and farmers join the journey and share their findings at host institutions along the route from small harbors to large ports from barns to museums (contemporary art, natural history and maritime) to social centers. 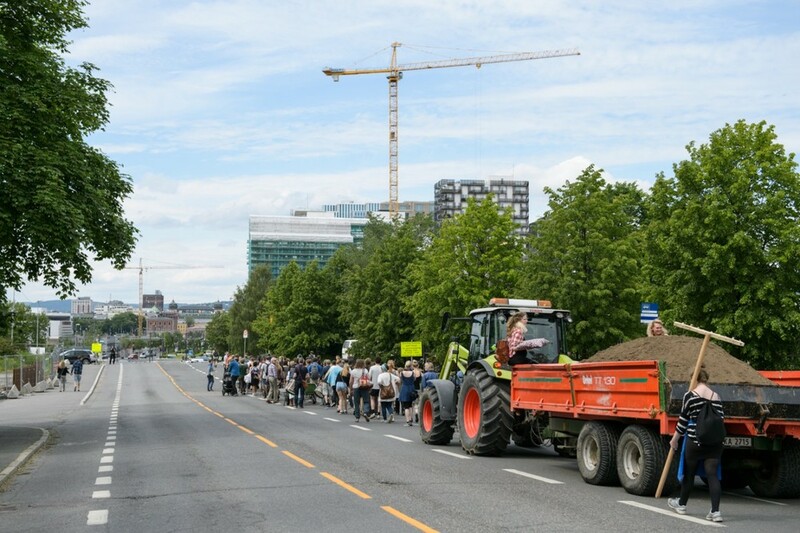 At each port of call, Futurefarmers held seed ceremonies for exchange with local land stewards, activists, and farmers. As a collaborator with the artist collective Futurefarmers, I am a participant and organizer for Flatbread Society Seed Journey. In Fall 2017 an international crew of artists, scientists, and writers will return a selection of the grains to the “cradle of civilization” sailing aboard a 110 year old rescue ship (RS-10 Christiania) as a way to trace the movement of grain through time, space, and phylogeny. In his essay “Seeds of Time” anthro-pologist Michael Taussig describes the project: “the return of the ancient seeds is like reverse engineering, taking apart fold by fold this long history and dense interaction. It is an allegory, this voyage, yet also an actuality, a becoming one forever open to chance, it being our participation from afar that breaths wind into the sails of the future.” While sailing aboard RS-10 Christiania with a cargo of see I will serve as a sailor, documentarian, and line between the worlds of art and sailing. I will also research how the languages of maritime visual signaling and hyper-communication relate to the sense and strategy of being lost at sea. Seed Journey sails upon Christiania RS10, an 1895, wooden rescue sailboat built by renowned shipwright, Colin Archer*. The idea of “rescue” in relation to this journey is key. Christiania is not only a “slow” and “safe” vessel, but also connects the ideas of exploration and loss to new ideas of rescue and findings. The re-tracing backwards the routes of these seeds and their cultures re-signifies these voyages from the 21st century vantage of having lost our flotation, lost our way; a “reverse Nansen”, “reverse Humboldt”, reverse “Darwin”, Cook, Magellan or whatever traveller you may want to choose. Flatbread Society has been collecting, growing and distributing a selection of “ancient grains” in Oslo since 2013. The selection of seeds to be taken on Seed Journey have been “rescued” from various locations in the Northern Hemisphere - from the very formal (seeds saved during the Siege of Leningrad from the Vavilov Institute Seed Bank) to the informal (experimental archaeologists discovering Finnish Rye between two wooden boards in an abandoned Rihii in Hamar, Norway). At the root of this collection is the notion of the “commons”. These seeds are robust symbols of resilience and knowledge. Once “weeds” these grains have been domesticated over tens’s of thousands of years by humans– cultivated by hand and exchanged through a complex hand-to hand network. Seed Journey will carry a small wooden box containing a selection of these grains that will be shared with fellow grain growers along the route. *Colin Archer was a renowned shipwright who designed vessels for Redningsselskapet (Norwegian Society for Sea Rescue) and is most known for the design of the Fram that took Fritjof Nansen's expedition farther north than any other wooden ship.